Christmas Ornaments Made in USA - 2007 Supreme Court West Plaza Ornament - A Christmas Ornament Co. 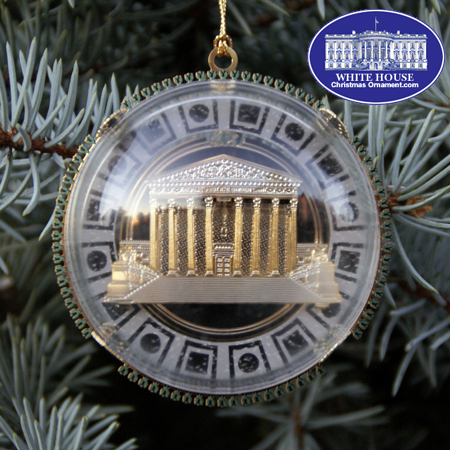 The White House Ornament Collection presents The Official 2007 Supreme Court West Plaza Ornament. The 2007 Supreme Court ornament depicts the facade of the Supreme Court West Plaza surrounded by the geometrical shapes set in the marble of the main entrance. This ornament is beautifully trimmed in 24kt gold plate, and is covered with a plastic dome. The dome is held in place by four "trees". The reverse side of this ornament is marked "Supreme Court of the United States" and is embossed with the date and the words "Equal Justice Under Law".